I was at the beach one sunny summer day and the beach shack sold a variety of treats, ice cream, soda pop and so on. Now I told my grandmother about a weird treat that they had been selling a few years back. I of course had never tried it but it sparked my interest. 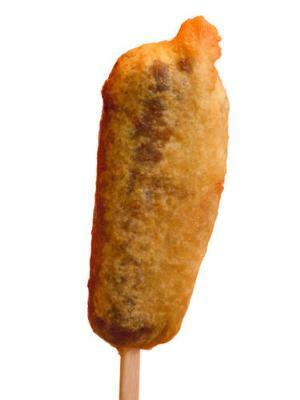 I look at it it look like a fried hotdog on a stick. It was weird and me being a vegetarian it didn't look very appetizing. My sister took the first bite then I took a nibble and then my grandmother took a bite. It tasted sweet and crunchy it had a hard outer shell with a amazingly soft middle. The way you eat it is you grab the stick and if you take a big bite its melts goo yum everywhere. I would not eat a whole one alone but it is definitely a treat to share! Join in and write your own page! It's easy to do. How? Simply click here to return to Weird Foods .